Returning to filmmaking after saying he was retiring in 2014, the 80-year-old Loach rails against the system with his trademark style of stripped-down social realism. Despite the film’s deliberate pace, quiet tone and intimate camerawork, his rage is unmistakable. His drive to tell the stories of ordinary citizens is clearly as strong today as it’s ever been, and he isn’t interested in letting anybody off the hook with a happy ending. “I, Daniel Blake” is an extremely Ken Loach-y Ken Loach film, for better and for worse. The surprise winner of the Palme d’Or at this year’s Cannes Film Festival follows a middle-aged, blue-collar carpenter struggling to navigate the bureaucracy of the British benefits system after an injury leaves him unable to work. Aside from some glimmers of humor early on, it is relentlessly bleak and not terribly subtle as it attempts to create an abiding feeling realism. But Loach’s film also features some stirring performances and a strong sense of place in its depiction of working-class Newcastle. Stand-up comedian Dave Johns, starring in his first feature film as the title character, has an everyman directness that makes him instantly relatable before we even see him. We hear him first, over the opening titles, answering ridiculous, circular questions from a government health-care agent that don’t get to what’s really ailing him: his heart. With his thick, musical accent, Daniel can’t help but respond with humor and incredulity in the face of such cluelessness. Who hasn’t felt the same frustration, whether it’s with the bank, a utility company or our own health insurance provider? But this truly is just the beginning for Daniel, who runs into an even more maddening battle when he physically goes to the benefits office with the hope that an actual human being might help him. Here’s where the veteran director and his collaborator of many years, screenwriter Paul Laverty, undermine their very worthwhile point, though. Except for one unusually kindhearted woman, they depict all the employees there as monsters, from security guards to case analysts to managers. It’s a pretty black-and-white situation without a whole lot of room for shading. While he’s there, however, Daniel meets a young woman who’s in an even direr financial situation than he is: Katie (Hayley Squires), a single mother who recently moved to town with her daughter and son because they couldn’t afford to live in London anymore. Katie dreams of returning to college and getting a degree, but in the meantime she goes door-to-door seeking house cleaning work and forgoing dinner so her kids can eat. For the most part, Loach depicts her plight in matter-of-fact fashion but with obvious appreciation for this character’s sacrifices. Her welfare claim rejected, Katie goes with great shame to a food bank to feed her kids in the film’s most quietly powerful scene. Subsequent acts of desperation, however, become increasingly melodramatic and maudlin. But the friendship that develops between Daniel and Katie is rooted believably mutual sympathy, compassion and respect. Daniel, a widower with no children of his own, comes to function as a father figure to the kids and a much-needed handyman in the family’s dilapidated apartment. In return, the gregarious but obviously lonely Daniel gets to enjoy their company, including a pleasingly platonic relationship with Katie. The sweetness and simplicity of their arrangement is the film’s chief bright spot in an otherwise complicated world. Escapist cinema, it is not. 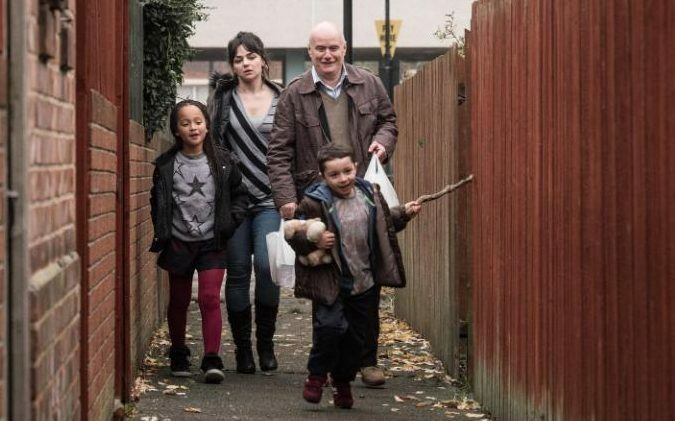 But with “I, Daniel Blake,” Loach is using the medium for one of its most crucial purposes: to shine a light on injustices he sees all around him, as well as on our capacity for human decency.